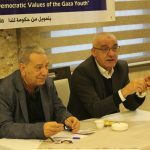 As a part of “Promoting Democratic and Civic values for Youth” Project, Pal-Think for Strategic Studies held the eighth session, entitled “Palestinian Democracy: Inroads and failures” in the Gaza Strip. The session was presented by the writer and political analyst, Mansour Abu Karim, with the participation of a group of 20 young men and women from several universities and governorates. The lecture was opened by Mr. Omar Sha’aban, the director of Pal-Think; he welcomed young participants and Professor Mansour Abu Karim. Mr. Omar spoke about how Pal-Think, based on its mission, seeks to educate the youth and increase their knowledge and awareness so as they could contribute to Palestine, locally, regionally, and internationally. “This project supports the Palestinian youth and contributes to enriching the culture of democracy, especially with regard to the Palestinian elections”, he added. Mr. Mansour Abu Karim began his session by talking thoroughly about the democratic experience of the Palestinian situation. He contended, “We, as young people, are caring about the Palestinian situation, studying and analyzing it to reach clear convictions, to learn about the strengths and how to promote them; what are the weaknesses and how to avoid them.” Furthermore, he reviewed the Palestinian democratic experiment and the history of elections with regard to the Palestinian situation, explaining the stages it underwent and the beginning of forming a Palestinian identity and national identity. He discussed with the participants the concept of democracy and elections and the suffering of the Palestinian situation, confirming the need to strengthen the rule of the people as a basic source for democracy. Very motivated, he expressed how we, citizens, need to be motivated enough to consolidate participation in elections, without allowing anyone to take advantage of our circumstances. Participants understood how people should be fully aware of the importance elections and democracy. Eventually, participants were divided into two groups: one representing strengths and the other weaknesses in order to review the Palestinian democratic situation and identify its failures and successes. organize a lecture entitled "The Role of Educational System in Promoting Democracy"